To convert a value from octal to binary, we first need to know what an octal number is. A major numerical system, or base, used in digital electronics, is the octal system, also known as base 8. In this system of numbers, the symbols are counted only from ‘0’ to ‘7’. In base 8 we use only 8 different symbols. The binary system (base 2) has only two symbols, '0' and '1'. 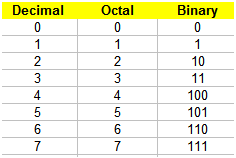 The following table shows the meaning of all the symbols in the octal system and their conversion to decimal or binary equivalents. To convert a value from octal to binary, you merely translate each octal symbol to the equivalent 3-bit binary group. For example, the octal number 537 translates into the binary 101_011_111 equivalent. In Matlab, we can go from octal to decimal, and then, from decimal to binary. We can use instructions ‘base2dec’ and ‘dec2bin’ for this purpose. Function base2dec converts base N number string to decimal number. Its syntax is d = base2dec('str', base). For example, base2dec('10', 8) produces an 8. Function dec2bin converts a decimal number into a binary string. Its syntax is b = dec2bin(d). For example, dec2bin(5) produces the string ‘101’. It’s important to remember that both binary numbers and octal ones are treated as strings in Matlab. Now, let’s say that we want to explore how the octal characters are separated to form the binary symbols and how we can manipulate our own strings (binary and octal). We can develop a function to translate the table shown before. Our proposed method uses a switch-case structure.